1. A chance occurrence of events remarkable either for being simultaneous or for apparently being connected. 2. A sequence of events that although accidental seems to have been planned or arranged. Once in a while we need a little relief from the extreme pain we endure from banging our heads against the wall over and over again; while we wrestle with the many questions we’ve had for so long, but can never find the answers to. There are other fascinating aspects of a true story-ya know-and sometimes diverting your attention to an equally addicting mystery can numb the pain…however temporary it may be. So let’s take a brief break from investigating the facts and circumstances surrounding the Manson/Tate/LaBianca cases. Let’s refrain from the head banging and enjoy a little play time, shall we? I don’t remember the first time I learned of this whole “coincidence thing” - I’m guessing it was in junior high. A teacher or student brought up a series of too-good-to-be-true, seemingly uncanny, “coincidences” between the assassinations of Abraham Lincoln and John F. Kennedy. I was instantly, and forever, intrigued. 1) Lincoln’s secretary’s last name was Kennedy. 2) Kennedy’s secretary’s last name was Lincoln. 3) The only known film of Kennedy’s assassination was shot by a guy named Abraham. Are you with me? Good. Thank you. A lot of my Manson/TLB research was happening at the same time the O.J. Simpson case was unfolding and taking center stage under the international spotlight - which made it a lot more interesting considering these crimes happened in the same city, in close proximity, and almost exactly 25 years apart. 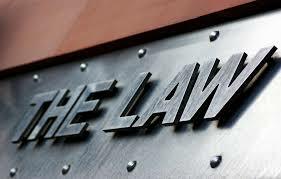 There were also a significant number of commonalities between the two crimes. Hollywood types, beautiful blonde woman, multiple stab wounds, constant media coverage, etc., etc. Again, I’ll save space by not getting into details that are very easy for anyone to research. At some point I recognized a “Coincidence thing” between the Manson and O.J. cases. It was too obvious to ignore. 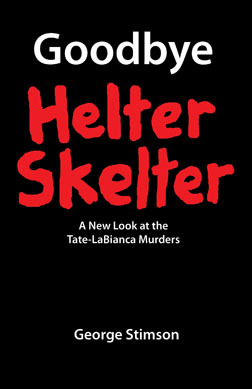 There was even a Ronald Goldman listed in the index of Helter Skelter (I think his was one of the first attempts to score the role of a lifetime by becoming Manson’s attorney). Of course there’s more. Keep them Google thinking caps plugged in! Are you still with me? Great! Thanks again. During the summer of 1996 (and later on) I spent some time running around with a well-known Manson/TLB author/researcher. I won’t name him in this article because it would only serve as a distraction to the point. One day he took me to the site of what used to be the Western Surplus store. Yes, the very place that Gypsy, Mary, and the boys attempted to rob at gunpoint on August 21st, 1971 (No one inside the store got hurt, but Gypsy and two of the boys got shot up pretty good by the blue meanies). I was thrilled to finally see this place I had only read about. The last thing on my mind at the time was hunting for coincidences. Yeah it sucked, but it was still exciting to be there and check the place out. I mean, honestly, I wasn’t exactly shocked that a store that had been there 25 years ago was not there anymore - just slightly disappointed. While approaching the front of the store, the first thing I noticed was a colorful, hand written flyer taped to the window - with the words POOH BEAR highlighted and written in very big letters (Valentine Michael Manson - Charlie's son by way of Mary Brunner’s - was nicknamed “Pooh Bear” after being born at the ranch). Oddly, the place was closed. It was a weekday afternoon and all the surrounding stores were open. "What's goin' on here?" I wondered. Okay. The “Pooh-Bear” thing wasn’t a big deal really; I could walk away without the compulsion to share that with anybody. But, in addition, a robbery & shooting? At the same store? Well, honestly, that’s not a big deal either - considering it’s L.A. I could just as easily walk away. However, now, I might feel somewhat compelled to mention these coincidences to a few people. Casually of course – I wasn’t sold yet. I decided to let the talking woman keep talking. And talk she did. As it turned out, “Pooh Bear” was a missing dog - the flyer was an announcement with a reward posted. Poor Pooh-Bear (along with his brother, “Care-Bear”) was kidnapped; taken from the widow’s backyard in broad daylight not long after her husband’s murder. “Whoever this woman is, life is being incredibly cruel to her right about now,” I remember thinking. The newspaper clipping taped to the window was all about the crime. The robbers came in and ordered the owner’s son, an employee, to lie face down on the floor (just like the robbers in ‘71had ordered employees to do). The owner was then shot and killed in front of his son after emptying the cash register for the robbers. He was a hardworking, community oriented, very generous, and well-loved guy. I was getting the accurate impression the crime was pretty well known, locally, at that time. There was a buzz about it in the neighborhood air - And it reeked of sad. No! I read it correctly! 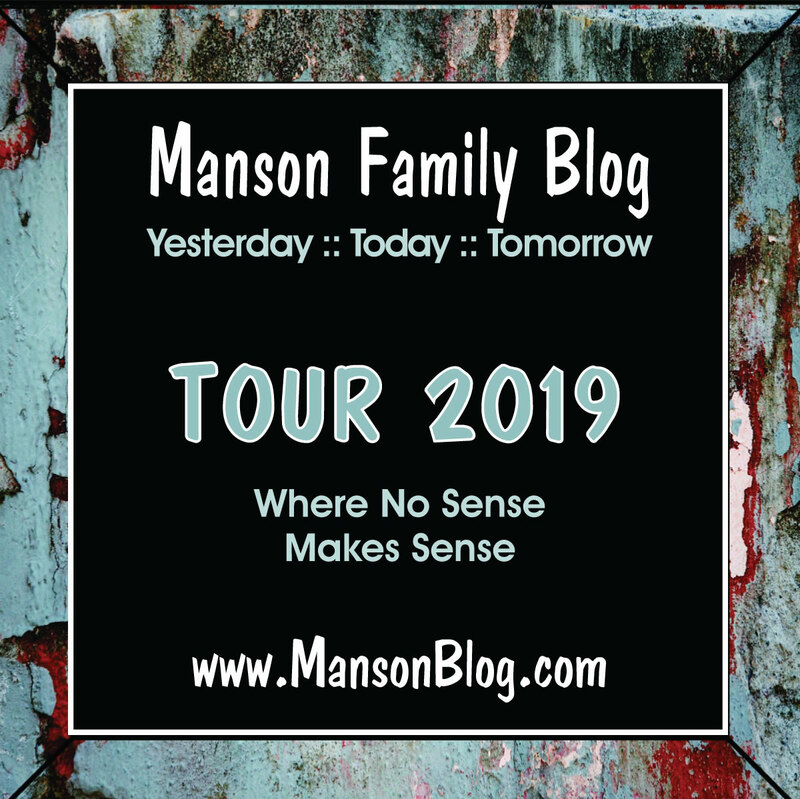 It says MANSON – and they are not talking about Charlie. I was happy to realize I wasn’t hallucinating at all. I wasn’t losing oxygen and seeing stars; I wasn’t about to faint. It was a guy named Ronnie Manson, and his name was mentioned at least twice in the article (without any mention of the irony). He was a local, long-time customer of the store who was very eager to see justice for the victim. Not only was Mr. Manson very fond of the victim, he was also holding vigil outside the store. He was staying, he declared, until the murderers were caught. Much like Charlie’s Angels were holding their vigil (during the trial) outside the Hall of Justice until he got out. I can’t testify as to if Mr. Manson actually followed through with the vigil, but at least that’s what he said he was doing. The talking lady somehow slithered away during my coincidence episode. She was gone. No one was there - just myself and the researcher/author I mentioned earlier. So what did we do? We did what all the lonely people do; we did lunch. Almost directly across busy Hawthorne Blvd., we noticed a place called “Pizza Show.” We both loved pizza way too much so there wasn’t any question where we were going next. And the place seemed very inviting from the outside; It looked retro and unmolested. I pictured The Brady Bunch going there for some big family celebration - like maybe Greg’s (smoke-free) 16th birthday party. I’m a pizza connoisseur (I even make it from scratch once in a while) and this place screamed “Good Pizza!” That’s actually saying a lot because good pizza in L.A. can be very hard to find. “Oh man! This looks like something from an episode of Dragnet” I told my lunch partner as we walked in. It would’ve been rhetorical to ask an employee if the place was in operation when the Western Surplus shootout happened; it was very clear the answer was yes. We were seated. We ordered. We ate. The pizza was great as expected. I don’t know if it still is today but it was then. I laughed. We both laughed. Luckily she didn’t get spooked by our laughing; she got curious. “What’s so funny?” Rosemary asked. We asked her if she remembered a robbery/shootout across the street 25 years ago. She got very excited. “I was HERE when that happened!” she boasted. “No way!” I yelled in my head. This was turning out to be one hell of a day. “No one’s gonna believe this” I blurted out loud. My lunch partner grinned with “I know” written all over his face. She remembered, during the shootout, some of the cops had taken cover in the pizzeria; they were waiting for the bad guys (and girls) to emerge from behind Western Surplus. “It sounded like the Fourth of July with all the gunshots,” she mentioned as she shared the entire suspenseful story with us. It was a surprisingly interesting perspective of the events that day. “I was also here when the place got robbed again recently,” she added. As she was talking about the recent crime, I managed to slip in a question about if she knew anything about some guy named Manson who likes to hang around at the Royal Cyclery. Wouldn’t you know it? Captain Coincidence just wasn’t letting up on us today. At this point I should’ve expected her to say what she just said. I should’ve been able to tell her before she told me. Rosemary explained her remark. The local Manson was some homeless guy who had caused some trouble in the past. Apparently Mr. Manson had been inside Pizza Show some time ago behaving erratically; causing people to feel uncomfortable enough to collectively request his immediate removal. The manager obliged by throwing Mr. Manson out the door. Mr. Manson responded by lying in wait outside, near the parking lot; anticipating his new nemesis to appear en route to his car. He finally appeared – And so did Mr. Manson; with a “butter knife” in his hand. I was all out of reactions by then. There are, no doubt, more details and dialogue that I could color this story with. But time has an innocent way of stuffing memories (significant or otherwise) into a misplaced shoebox. Unfortunately, in 1996, not many people had cell phones. And those who had one, more than likely, could never have imagined that someday they’d be able to take pictures and shoot video with it. I sure wish I had an iPhone back then. I wish I had a picture of the Pooh-Bear flyer and newspaper article taped to the window. I wish I had video of the talking woman. I wish I had video of Rosemary telling her story inside Pizza Show. I wish I had a picture of the pizza. And…we’re not done with the coincidences…yet. I found the Royal Cyclery article online. You can read it HERE. As it turns out, the article is dated August 8, 1996 (I didn't remember that). Depending how tired you are (or how dirty your computer screen is), it could easily be read as August 8, 1969. If you need to be refreshed on the Western Surplus robbery, check out a great article HERE on Cielodrive.com (Amazing work with your site, Cielo!). About 4 blocks south of Royal Cyclery, there once stood “Hawthorne Grill” which was the diner used in the movie Pulp Fiction. It was already closed, but still standing, when I was there in ’96. 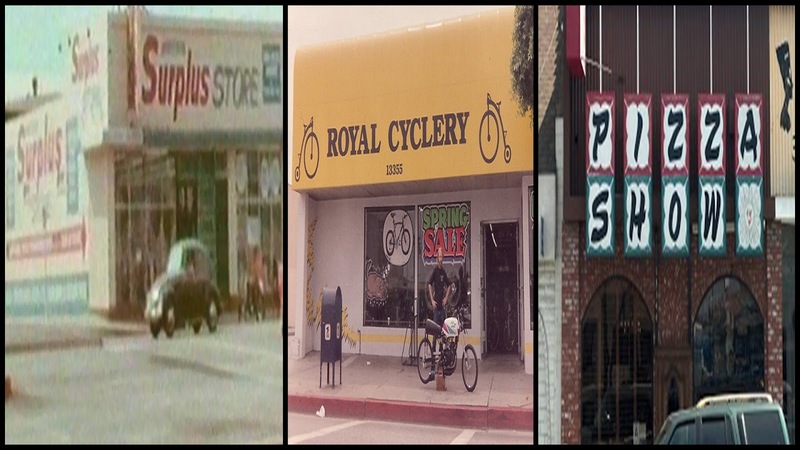 It’s since been demolished and replaced by some giant auto parts store. Across the street from the diner is “Bluebird Liquor" - one of those lucky liquor stores that people drive hours to, to buy lottery tickets. The murders were set in motion 8-8-69. Another famous series of murders took place on a date where the number 8 repeats itself. They occurred in Whitechappel in 1888. The update on Dennis Rice says he was diagnosed with liver cancer just two months ago. It seems to me that the diagnosis was made more than a year ago. Does anyone else remember reading of the cancer earlier? Matt, your Dennis Rice comment really isn't off-topic. Dennis was involved in the robbery and shootout at the Western Surplus Store - a topic of Max's post today. It's another coincidence. Gibby had her legs splayed with the knees apart and her hands over her head. Patty posed on Michael's fake outline which has the legs in more of a running position and hands at the side. The outline is of no one in particular. Who has ever head of a chalk outline ON GRASS? Seems Patty is not the only gullible person around these parts. Well I for one am so glad that a dinner used in the filming of an iconic movie is now an Autozone. Thanks a lot Doc - appreciated. You seem to have gotten a scoop. I haven't been able to find informarion about Dennis Rice's death anywhere but in the links you put up. Well, link #2 is the church he pastored so I take it as accurate. It's probably accurate. Information on Dennis has been kind of scarce and conflicting for a long time. I guess, he's not well known enough to get much publicity. I was just in this area two weeks ago. Have noticed the pizza place, will have to try it next time I am in Hawthorne. Hawthorne Blvd is an interesting street- urban with alot of street decay. Also on this street is the Foster Freeze the Beach Boys frequented while in High School- it is still there today. The Beach Boys memorial is only a few blocks away. It is on the spot, where the Wilson's home once was. the house was torn down for the freeway. Right across the street from the memorial are McMansions, but if you drive down the block aways, you can see houses that were typical of Hawthorne during that time period. I'm reading this on August 8th... I am dammed.